A piano, a girl and a great song. 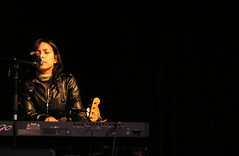 Emm Gryner, Canada’s next gift to music? Could be. In the meantime, have a listen to a song that actually incorporates Aurora (as in Borealis) into the lyrics. I have many memories of watching them dancing over my head, a real Canadian thing. Nice mellow tune. Going to look up more of her. Another song that namechecks the Aurora Borealis – The Muppets! The audio wouldn’t play. Have to try on my laptop. I think I played one of hers in the past and you liked it also. Ciao Monday was the song.